With Benefibre, get the fibre you need in a taste-free, all-natural powder you can add to any beverage or soft food. Unlike other powdered fibre supplements, Benefibre will not thicken or alter the texture of your favorite food. Benefibre is also great for cooking. Benefibre dissolves completely in water and soft foods so it is easily added to the things you normally eat and drink. Unlike most other bulk fibre powders, Benefibre is grit-free and non-thickening. Benefibre is taste-free, so you can add it to your drink or meal without altering the taste. Add Benefibre to any beverage (hot or cold) or soft food that you normally eat. With Benefibre, you have the freedom to take your fibre any way you choose. The recommended daily value of fibre for Canadian women is 25 grams, and 38 grams for Canadian men each day. But, Canadians average only half this recommended daily dose. Benefibre can boost your daily intake of dietary fibre easily and naturally. 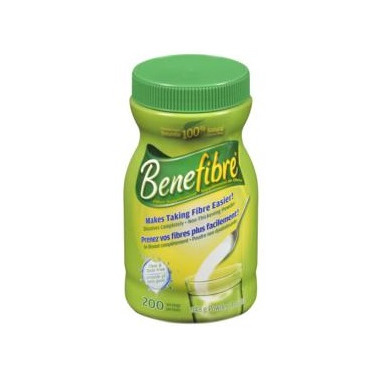 Each teaspoon serving of Benefibre provides 3 grams of soluble fibre. 100% inulin—no fillers, flavours, or sweeteners added. Each rounded teaspoon provides 3 grams of soluble fibre. I am so glad this came back on the market because I wanted a fiber option that wasn't like Metamucil. And this works like a charm.